1662: born in Edo. His father is Nakamura Kankurô I, the elder (and illegitimate) son of Nakamura Kanzaburô I. Fall 1673: first stage appearance; he receives the name of Nakamura Kantarô I. 8th lunar month of 1674: Nakamura Kanzaburô II dies. 8th lunar month of 1678: Nakamura Kanzaburô III dies. The new name-holder of this line should be Nakamura Kanzaburô III's son Nakamura Takematsu but he is too young to manage the family business and Nakamura Kantarô I has to take the name of Nakamura Kanzaburô IV. 28th day of the 12th lunar month of 1682: a fire started by Yaoya Oshichi breaks out in the Daienji Temple in the district of Komagome. It spreads and destroys the Nakamuraza. This fire is nicknamed "Oshichi Kaji" (the "Oshichi fire"). 16th day of the 12th lunar month of 1683: a fire breaks out in the Nakamuraza and destroys the theater. 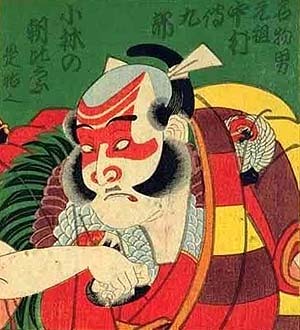 1st lunar month of 1684: Nakamura Kanzaburô IV takes the name of Nakamura Denkurô I at the Nakamuraza, playing in the drama "Shuten Dôji Oni Taiji". He entrusts the management of the Nakamuraza to Nakamura Takematsu's care, who takes the name of Nakamura Kanzaburô V in the 10th lunar month of 1684. 1st lunar month of 1686: Denkurô plays at the Nakamuraza the role of Kumahara Wadanosuke in the new year drama "Wankyû Ukiyo Jikkai"; his stage partners are Nakamura Shichisaburô I (Ôtomo Minbu), Tamagawa Sennojô III (Senju), Mikuni Hikosaku II (Wan'ya Kyûbê), Dekishima Kichiya (Hatsue-no-Mae), Uemura Kokichiya (Kiriyama), Hanai Saizaburô I (Sôhachi), Fujita Minanosuke (Sôhachi's wife), Tamai Gonpachi (Kichibei) and Hanamura Kinue (the courtesan Matsuyama). 3rd lunar month of 1688: Denkurô plays for the first time the role of Kobayashi no Asahina in the drama "Yakko Asaina Ôiso Gayoi", which is staged at the Nakamuraza. Mai 1693: Denkurô plays at the Nakamuraza a fox role in the drama "Shinsen Sesshô Seki". 11th lunar month of 1696: Denkurô plays at the Nakamuraza in the drama "Neko no Koneko", commonly called "Onna Narukami". His stage partners are Ichikawa Danjûrô I, Ogino Sawanojô, Nakamura Shichisaburô I, Ôtani Hiroemon I, Sodeoka Masanosuke II and Nakajima Kanzaemon I. 5th lunar month of 1697: Denkurô achieves a great success by playing at the Nakamuraza the role of Kobayashi no Asahina in the drama "Tsuwamono Kongen Soga". His stage partner in the role of Soga Gorô Tokimune is Ichikawa Danjûrô I. 7th lunar month of 1697: the Nakamuraza has to close and its troupe moves to the Yamamuraza. 11th lunar month of 1697: Denkurô achieves a great success at the Yamamuraza by playing the role of Hirai no Yasumasa in the drama "Wakashu Tanzen Tomo Yakko". 1st lunar month of 1699: Denkurô's rank in the Edo hyôbanki, tachiyaku section, is jô-jô (superior - superior). 1st lunar month of 1700: Denkurô's rank in the Edo hyôbanki, tachiyaku section, is jô-jô-kichi (superior - superior - excellent). He plays at the Yamamuraza the roles of Kobayashi no Asahina and Soga Gorô Tokimune in the new year drama "Keisei Asama-ga-Dake". Spring 1704: Denkurô plays at the Nakamuraza in the drama "Shinshun Niwatori Taiheiki". 1st lunar month of 1705: Denkurô plays at the Nakamuraza the roles of Kobayashi no Asahina and the tôfu seller Densuke in the new year sogamono "Onna Kudô Yosooi Soga". 11th lunar month of 1707: Denkurô becomes jitsuaku and achieves a great success by playing at the Nakamuraza in the drama "Suô no Naishi Azuma Nishiki". 1st lunar month of 1708: Denkurô plays in the same theater the role of Kobayashi no Asahina in the new year drama "Keisei Arashi Soga". The roles of Soga Gorô Tokimune and Soga Jûrô Sukenari are played by Tomizawa Hanzaburô I and Nakamura Shichisaburô I. 1st lunar month of 1713: Denkurô appears on stage for the last time, at the Nakamuraza, playing the role of Kobayashi no Asahina in the drama "Ôkazari Kanô Soga". 25th day of the 10th lunar month of 1713 : Denkurô died in Edo. Nakamura Denkurô I was an outstanding tachiyaku, who achieved fame for himself in the city of Edo. He formed with Ichikawa Danjûrô I and Nakamura Shichisaburô I a triumvirat of Edo actors, which led Kabuki during the golden years of the Genroku era. Nakamura Denkurô I's greatest performance occured in the 3rd lunar month of 1688, at the Nakamuraza. He played for the first time the role of Kobayashi no Asahina in the drama "Yakko Asaina Ôiso Gayoi" and created for this role several great features: a wig (itobin), a make-up (saruguma) and a beard style (kamahige). The 25th day of the 10th lunar month of the 3rd year of the Shôtoku era was the 12th of December 1713 in the western calendar.